8606 stands alongside Platform 16 at Central Station with E702 Robel Railset from Clyde. The site officer is giving the crew an introduction to the possession they will be entering to take their train to North Sydney to run around. At North Sydney, the train will return to Town Hall to drop rail on the up shore line. Unlike all other infrastructure trains to have run in the last few years, this one is hauled by electric traction - not diesel. Significantly, this was the first run of 8606 on a train in over a decade. Owned and preserved by Sydney Electric Train Society (SETS), 8606 has been in storage in Junee, and more recently Lithgow due to a lack of suitable locations in the Sydney metropolitan area. With a lot of effort and funds from the SETS group, 8606 returned to the rails under her own power in 2018. With initial trials at Lithgow successful, the locomotive was transferred to Sydney under her own power on the 27th of October. 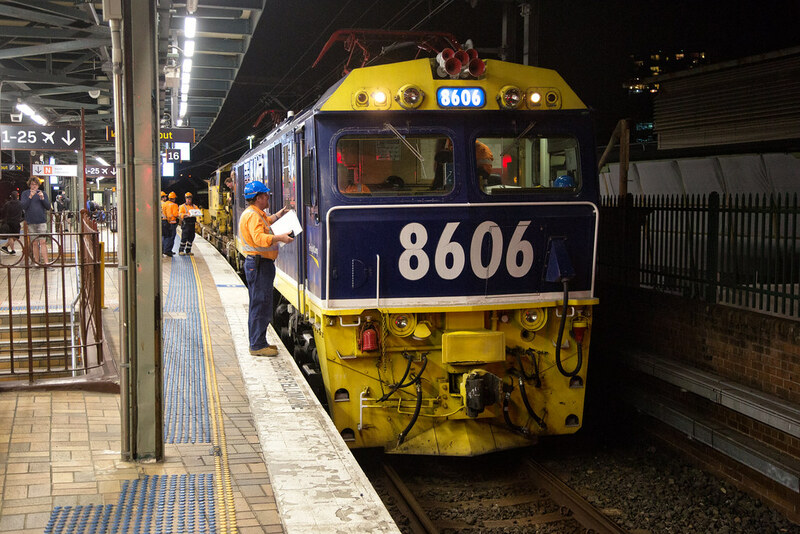 8606 has been fitted with an ICE radio and will be made available to Pacific National to assist with the Sydney Trains maintenance train contract. This enables works trains to enter the city underground without the concern about diesel fumes affecting passengers on other sections of the underground network. Previously 48 Class fitted with exhaust scrubbers have been used, however these are still less than ideal when there is no adequate ventilation.